This little event held in the extremely picturesque grounds of Henham Park, Suffolk, near to the familiar formation flypast navigation point of Southwold, has its short history very much in the ‘Wheels’ section of its title. John Hill, the organiser of the aviation aspect of the event, could have been forgiven for any thoughts of wishing it had stayed that way when, with just a day before kick-off, two of the three display acts had to cancel! John's military career included a ditching in a Sea King - would he be able to keep the display afloat? Phil Whalley went to see what could be arranged at such short notice. All photography by the author. Out of the three original items on the bill only the Pitts Pair were able to attend. A Yak-52 solo display was grounded with a serious engine problem, and the RedHawks Fournier Duo of RF4s flown by Bob Grimstead and Matthew Hill had to scrub as one of the pilots had broken a leg. Many frantic phone calls later and they were replaced by Maurice Hammond’s P-51 Mustang ‘Janie’ and the newly branded SWIP Team (formerly the Twister duo) of Guy Westgate and Pete Wells. All those involved deserve great credit for rallying to the call, including Dave Evans whose roll it would be to display the Mustang instead of whatever he had originally planned for his Sunday afternoon! The SWIP Team had already displayed at Abingdon before making the long journey across to Suffolk. The event as a whole is actually more of a fly-in, with about thirty visitors arriving during the morning. The temporary grass runway is a challenge for arriving aviators, being just 630 metres long and having trees at both ends and along one side. The tree lines also create turbulence, making for some very interesting attempts and a number of go-arounds. All made it safely down, although one kit built machine suffered a ground loop whilst taxiing, necessitating a departure on a flat bed trailer in a dismantled state. The smallest aircraft to arrive were a couple of flex-wings, an autogiro and an R22. More classic types such as Tri-Pacers, Jodels, an Auster and a lovely Tipsy Belfair made for an attractive sight in the beautiful stereotypical English country park setting. Around 400 classic vehicles made up the ‘wheels’ side of the event, which is organised by the Halesworth Lions in aid of charity, and attracts in the region of 5000 visitors. 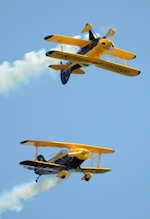 The flying display commenced in the afternoon with the Pitts Pair of bright yellow aerobatic biplanes flown by Richard Grace and Dave Puleston. This was their debut show of 2011, and the slight on-crowd wind and turbulent air was a test of their abilities. It was a well received display, despite some voiced self-criticism once back on the ground. Probably the highlight for many was the appearance of Dave Evans in ‘Janie’, accompanied by quickly rustled-up Glen Miller from an MP3 playlist! Making a number of fast and low passes, along with graceful loops and rolls, the P-51 looked stunning over the countryside backdrop. As it seems with many airshow locations, the only downside for the photographer is the head-on sun, accentuated at Henham by the dark shadows created by the trees. It’s a testing situation, but one to overcome. The SWIP Team closed the show, painting artistic patterns in the sky – a sky which had, thankfully, mostly remained bright for the day. 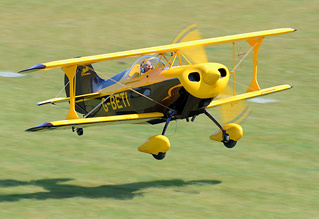 There are a number of these smaller flying events up and down the country, mostly run by volunteers working hard, and overthrowing set-backs like that at Henham, and often for charity. They deserve the support of the public, and great praise for their efforts. Next year’s event takes place on the 13 May, and I hope the team don’t have quite such a stressful 48 hours before that Sunday as this!